Fiadda Piemonte promotes a free event on hearing impariment in infantry. The event is titled "Voltare pagina, la sordità infantile tra passato, presente e futuro" (turning pages on infant deafness: a perspective toward the future), with the contribution of doctors, professionals & families on the perspective of care in the present & in the forthcoming future. 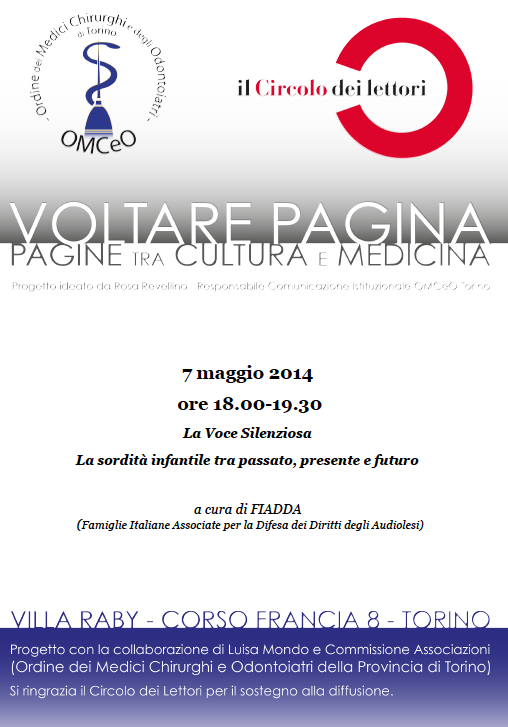 The event will start on Wednesday 7th May at 6 pm in the amazing Villa Raby in corso Francia 8, Torino. The project has been developed by Rosa Revellino (OMCeO Torino), in collaboration with Luisa Mondo & the NGO commission of the Order of Physicians & Dentists in the Province of Turin. A special thanks to the Reader Club of Turin for the support.